"Ghost in the Shell" is based on the Manga by Masamune Shirow. 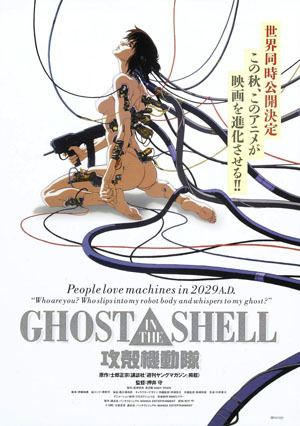 In 2008 a reproduced version of the film was released, Ghost in the Shell 2.0. William Vu Oct 23 2017 6:38 pm I’ve been always watching Ghost in the Shell in live-action adaptation. Scarlett Johansson plays as The Major, but is very cool action scenes. But one of two villains was Kuze or Hideo (played by Michael Pitt) and Cutter (played by Peter Ferdinando)... and they’re not supposedly for whatever it takes. The critics are whitewashing and was curiously like mixed reviews. But it will very good job for the cast members (Scarlett Johansson, Takeshi Kitano, Michael Pitt, Pilou Asbæk, Chin Han, Juliette Binoche, Peter Ferdinando and Kaori Momoi) and crew just like the director, Rupert Sanders. It was awesome fantastically of Visual Effects was made into the movie. It’s cool.